An incomplete cast-in-one copper-alloy middle or late Anglo-Saxon ansate (caterpillar) brooch. One terminal and part of the bow of this brooch now survive, but the rest is missing due to worn breaks. It measures 29.2mm in length and the bow is 14.4mm in width and the rounded terminal 19.5mm in width. The bow is arched and rises away from the terminal at a c. 45 degree angle. The reverse of this brooch is unusual. Projecting from the centre of the terminal there is a transverse catchplate consisting of an integral loop which has had a slot cut in it, measuring 8mm in width and 9.7mm in height. There are also the remains of another integral incomplete loop, just after the point where the terminal joins the bow, measuring 5.7mm in length and 2mm in width. 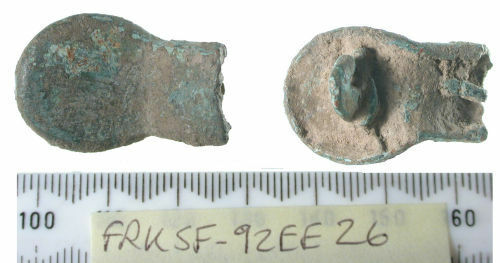 Weetch has allocated this brooch to her type II.Ai (ansate brooches with narrow bows and undecorated flat circular or oval terminals) but it also has affinities with type II.C, which has a wide rectangular-section bow and circular or oval terminals). Both types are dated to the 8th to 10th centuries. Included in Weetch 2013 as catalogue no. 1050.